Photograph​ic Proof of Osama bin Laden’s Burial at Sea! 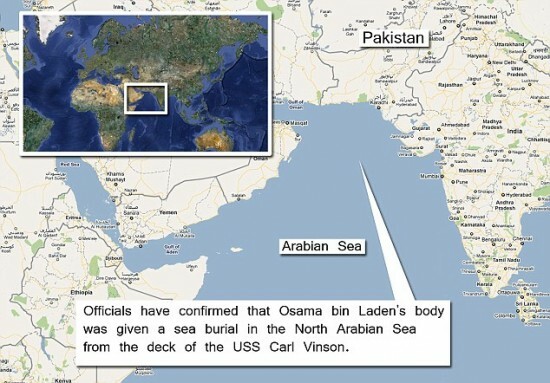 Will Osama bin Laden’s sea burial backfire, asks the Daily Mail? 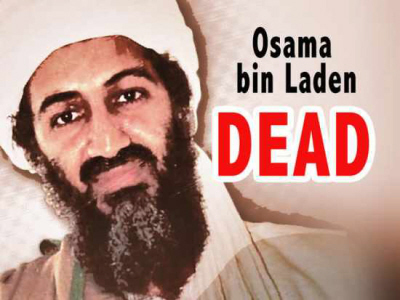 Radical Muslims are already calling the site of Osama bin Laden’s ocean burial the ‘Martyr’s Sea’, according to one of Britain’s leading Islamic scholars. The US said the decision to drop bin Laden’s body into the North Arabian Sea was taken to avoid creating a shrine for the slain Al Qaeda chief. But Abdal Hakim Murad, Muslim Chaplain at Cambridge University, claimed yesterday that the move could backfire on the Americans. Speaking on Radio 4’s ‘Today’ programme, he said it was ‘disappointing’ that bin Laden wasn’t taken into custody. ‘By tipping him into the sea, the Americans may have created a kind of shrine. Some radicals are already calling the Arabian Sea the Martyr’s Sea,’ he said. ‘Even mass murderers deserve a religiously valid burial. We are judged on how we behave when in a position of strength,’ he said. So many people have asked so many questions about Anita’s death that I feel obliged to address some of them, not as a lachrymose indulgence in mourning but as a good and godly opportunity for learnings we can all use and apply ourselves, because her preparations for physical death were as positive as her life always was. We are all going to die to this mortal world – perhaps Anita and my preparations for this inevitability, preparations both worldly and spiritual, can be of help to you. Continue reading Rev Elijah White’s story at Virtue Online. Where Is the Church Steeple? USA Today has a look at the decline of the Church steeple.